There was a doctor visit in November. At that time, Dr. Francis and I discussed the state of my RA. I don't necessarily feel worse. I have little aches, but, come on, we all have those from day to day. It wasn't pain. It was an ache in a joint; a thumb, a wrist, a toe, a shoulder. On a few days, at the end of the day, I'd take an aspirin or, if I knew I would be on my feet for awhile, I'd take an aspirin at the beginning of the day. I can't take more than two aspirin in a 24 hour period and, if the need for an aspirin continues over more than 3 days, I need to call Dr. Francis. I felt I was doing well, all things considered. That Vectra test changed the perception of what I'm dealing with. One simple number, 42, changed everything. Joking aside that it's the "universal answer to life, the universe and everything', it says I have moved into severe levels with RA. Left untreated, joint damage will occur. I'll get the bent fingers I remember a number of my great aunts having. 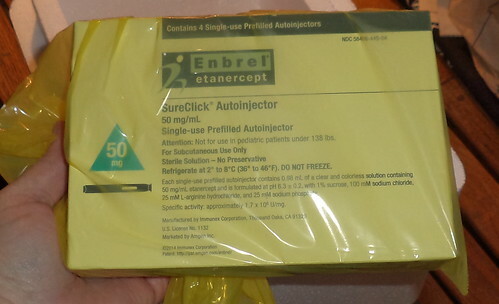 It was time, Dr. Francis said, to add one of the newer biologic drugs to my arsenal. At first, we tried to get Xeljanz. You might have seen their elegant black and white commercials on TV. It's attractive because it's a pill taken twice a day. It's relatively new to the biologic market. But, my insurer would not approve it. I was going to need to take one of the older established biologics and see if I have an intolerance issue with them before Xeljanz can be considered. They said I needed to start with Enbrel. You might recognize this name if you watch sports or a lot of TV. Golfer Phil Mickelson is the celebrity spokesperson for this. He has Psoriatic Arthritis and Enbrel was developed to treat that. But it's also useful for RA and for Plaque Psoriasis. Dr. Francis has a number of patients on Enbrel and she likes it. She has fewer on Xeljanz, but they are doing well. It is newer to her than Enbrel is, so she has less experience with it. Still she went to bat for me to get what I thought would be much easier for me to take. This comes as a pen-type injector which I need to do myself. This scared me to no end. I know of people who have to give themselves shots and I admire their fortitude. But, if I'm going to progress on, I needed to get over my fear and learn to do this. Just telling me "it's easy" is not helpful or mind settling. 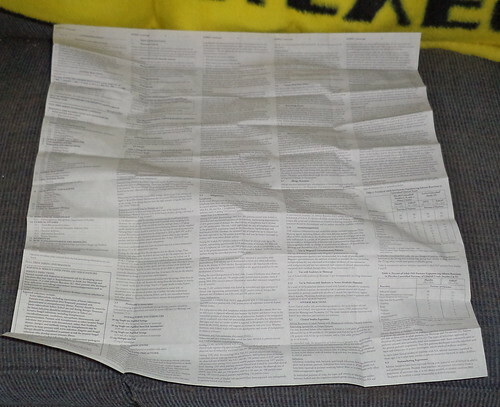 For drugs like these, the data sheet rivals a small novel. I spent last night on the phone with nurses from the pharmacy that sends me the Enbrel and with my insurance company going over the side effects. Unfortunately, there is no magic "by" date to tell me if I tolerate this without side effects. I can say that I haven't grown a third eye or have been covered in hives. One side effect to consider with the holidays approaching is that my immune system is suppressed and I will be less able to fight off colds. That means there probably aren't going to be a lot of "Aunt Debbie" hugs at Christmas, particularly if someone has the sniffles. I got the flu shot this year but am slightly worried about my health since reports are that the flu shot may not help one's immune system fight the flu. I've been informed that what is usually a 7 day battle with a cold, could be a 2 week battle for me. That's a long time to be sick. It means hand washing is huge for me and, although I like you, you might have to stand over there to talk to me. Nothing personal. Just know I don't want to be near you if you're sick. An interesting thing about this medication is that it comes chilled. It needs to be kept refrigerated. 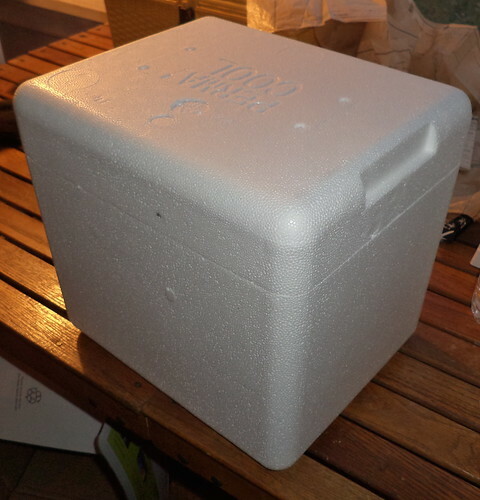 I had it sent to the office where we have a mini-fridge and I could keep it cold. Technically, deliveries in the winter shouldn't be affected, but the last thing I wanted was for someone to swipe the box off the front porch, too. Since the delivery is next day, I can call for a delivery on a day when I know I will be in the office to sign for it and put it in the fridge. My first box came with all this stuff. 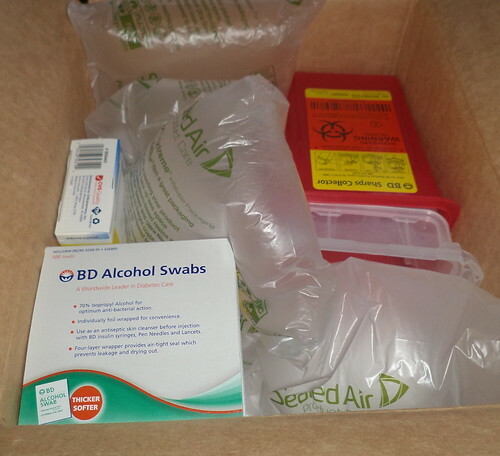 There are small circular band-aids, alcohol pads for cleaning the injection area and a sharps container. I'm not a bleeder and often, after having blood drawn at my RA appointments, I will forego a band-aid. But I've noticed that there is just a pin prick spot at the injection site and a band-aid is helpful for a couple hours. I don't know, yet, when I will send the sharps container back, but I like that it's small enough to sit on the shelf in the bathroom yet it appears it will hold a couple months worth of pens. 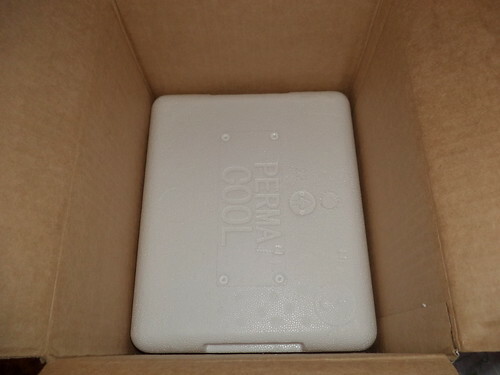 The drug itself arrives in a styrofoam cooler. 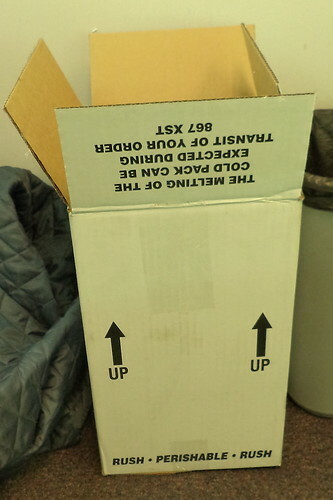 It was a perfect fit for the box and getting it out at the office involved removing the top, grabbing both sides and shaking the box so it would drop off. It fits nicely in the office fridge. A 6-pack of soda is probably all that would fit in here. The box of pens, 4 to a package, was under and on top of gel packs; 2 on top and 2 on the bottom. Since this is a month's worth of drugs and I have to do this now forever, or until something changes, the thought of all these coolers and gel packs in my house makes me weak. I was informed that, once I've been on this for 3 months and if I'm tolerating it well, I will get my 4th shipment as 3 month's worth. Well, that's still a cooler and gel packs. I don't know if I can recycle those, although the styrofoam cooler I can. The last thing I need are stacks of gel packs in my freezer, although they last a long time and keep frozen dinners frozen. I went to the doctor's office and learned how to give myself the shot. It went okay under my doctor's nurses' watchful eye. The next week, it stung a bit when I did it on a Saturday in the bathroom. Last week, however, it didn't hurt beyond the initial pin prick. I have to take the meds out of the fridge and let them come to room temperature for at least 30 minutes. This past week, I waited 40 minutes. When I use the alcohol pads to wipe off the injection site, I need to make sure all the alcohol has evaporated or that will sting. Once I see the indicator on the pen go to solid purple, I count to 5 before removing the pen from my leg. This way I make sure all the medication has been delivered. Do I have an immediate feeling for change? No. Yeah, I was hopeful there would be some dramatic feeling better, that this almost crushing fatigue I fight would be lifted. But, with a drug like this, my body has to get used to it being in my system and that takes time. It could take as long as 3 months. I need to be better by March so I can go back to Virginia and not be completely wiped out by the travel. 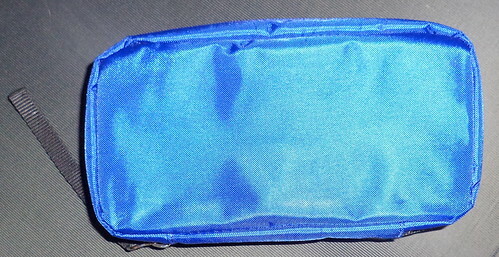 And, speaking of Virginia, they provided me with a travel pouch. It has gel inserts. The whole thing goes into the fridge before I travel and then a month's worth of pens can be put inside the case. The pouch will keep them chilled for up to 14 hours. When I go to Virginia, I'll have this and a cooler for travel. Things you have to plan for that you didn't before. One of the questions the nurses ask when going over the drug is if you are depressed. I've been thinking a lot about that question on my own. Am I fatigued because of something else? It comes back to no and I expressed that to the nurses. I'm tired. Both the reading I've done and Dr. Francis agree that my fatigue is due to the RA. She doesn't guarantee I will feel better, 66% of patients report an easing of symptoms, but Dr. Francis feels this is the best route to go. Once there is enough drug assisting my body in fighting this disease, then I won't feel so tired anymore. Here I go, walking down a different road. Right now, if feels as if the road is going up and up and it's hard to climb. It's not filled with pot holes or boulders, it's just steep and I'm struggling to progress. I'm hopeful this will do the trick and give me back my energy. I miss feeling refreshed all day.